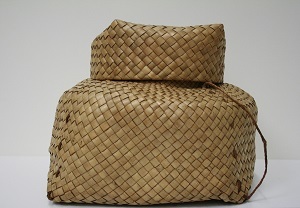 Maui Arts & Cultural Center, in collaboration with Bishop Museum, is pleased to present Nani I Ka Hala: Weaving Hawaiʻi. Hala or pū hala, known in Western science as Pandanus tectorius, is among the most important plants in the ecological and cultural history of Hawaiʻi and the broader Pacific. This exhibition explores the beauty of mea ulana (woven objects) from ceremonial and everyday use, displaying the generational knowledge of hala from ancestral to modern times through historic works from the museum's collection. An accompanying invitational exhibition, Hō Mai Ka Hala: Bring Forth the Hala, will present the work of contemporary lau hala weavers from Maui, Oahu, Kauai, Molokai, and Hawai'i Island. These artisans fall within the hierarchy of kumu (master teacher) and haumana (apprentice) levels of accomplishment as weavers of lau hala. Their work will represent the individual techniques, style, and designs of each island. Shane Carey, Josephine Fergerstrom, Pohaku Kaho‘ohanohano, Gwen Kamisugi, Pam Lipscomb, Margaret Lovett, Marques Hanalei Marzan, Michael Nāho‘opi‘i, Marcia Omura, Hilary Parker, Jean Sakutori, Ka‘ohuoka‘ala (Duncan) Seto, Lola Spencer, and Michele Zane-Faridi. Nani I Ka Hala: Weaving Hawai‘i was developed by the Bishop Museum in cooperation with Michigan State University Museum and Hawaiʻinuiākea at the University of Hawaiʻi at Mānoa. Funding for this exhibition was provided by the National Endowment of the Arts (NEA), the Institute of Museum and Library Services (IMLS), and the Nordstrom Foundation. The Hō Mai Ka Hala: Bring Forth the Hala exhibition is presented by Maui Arts & Cultural Center and supported in part by the Fred Baldwin Memorial Foundation, the Hawai‘i Tourism Authority, and the County of Maui, Office of Economic Development. Join us for a symposium to learn about the history, cultural significance, ecology, and practice of mea ulana lau hala. Maui Arts & Cultural Center’s director of cultural programing, Hōkūlani Holt, will be the moderator for our guest panelists, Marques Hanalei Marzan, cultural resource specialist at Bishop Museum; Pōhaku Kahoˊohanohano, artisan and cultural specialist; Josephine Fergerstrom, lau hala weaver and kupuna kumu; and Dr. Art Medeiros, research biologist. Saturday, November 14, 2015; 10:00 am – 12:00 pm; Schaefer International Gallery FREE to the public. This family program offers a guided walk-through of the exhibition and an opportunity to meet lau hala artisans and watch a demonstration of their weaving techniques. Attendees can try their hand at working with the materials and make a small piece to take home. Distinguishing this event will be an additional presentation in the MACC’s Alexa Higashi Meeting Room from 11:00 am -12:30 pm given by noted authors of the book, ‘Ike Ulana Lau Hala, featuring Kuʻuipolani Wong, Ph.D., R Kekeha Solis, Ph.D., and Lia O'Neill M. A. Keawe, Ph.D. All three are notable professors at the Kawaihuelani Center for Hawaiian Language at the University of Hawaiʻi at Mānoa. 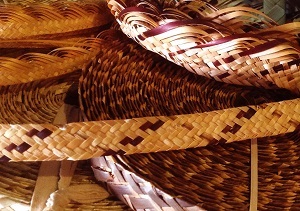 The book provides a collection of articles and images about the Hawaiian tradition of ulana lau hala: the weaving, by hand, of dried Pandanus tectorius leaves. This text considers the hala leaf through several, very different lenses: an analysis of lau hala items in historic photographs from the Bishop Museum collections, the ecological history on hala and the serious challenges to its survival in Hawaiʻi and the Pacific. This panel presentation will open with a brief overview of ʻIke Ulana Lau Hala: the vitality and vibrancy of lau hala weaving traditions in Hawaiʻi. Each panel member will then discuss their contribution to the book. The presentation will conclude with a Q & A session and is part of the Schaefer Gallery’s free public programming.